Users can upload their own documents directly to the web-to-print online shop. First they choose a print product that corresponds to their desired end product, an "A4 brochure" for example. Then they start uploading. After checking the document in the preview and choosing the final print settings, the print job is transferred to the print room securely. There it is imported seamlessly into your software solution for central print management where the imposed document is ready for printing - even automatically if needed. When converting a document into a PDF file it may happen that some bugs are included which can cause problems during printing. To avoid such bugs we developed Flux Web Printer, a printer driver which users can install on their Windows system. 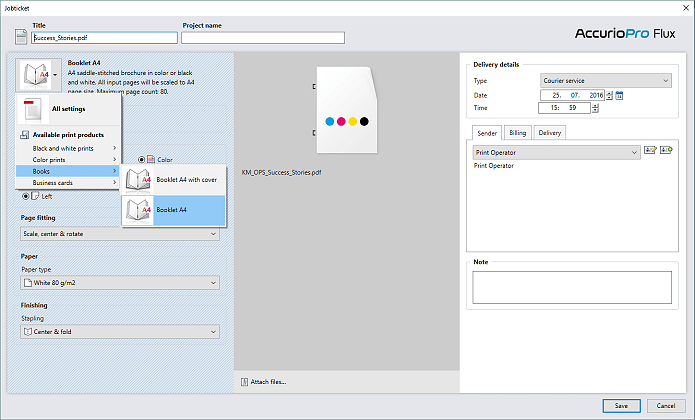 Using Flux Web Printer users can send their print files directly from the source application (e. g. MS Office) to the web-to-print online shop without any prior conversion to PDF. Do you have customers – companies, for example – that want to provide their employees frequently used forms, brochures or manuals centrally? Then use the catalog feature available in the web-to-print online shop. In catalogs customers can offer print-ready documents to their users for comfortable ordering. Do your users order particular print jobs frequently? No problem! 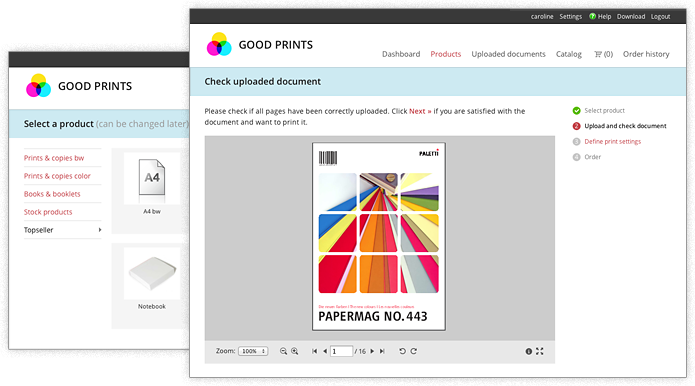 All uploaded documents are stored in the web-to-print online shop together with the chosen print settings. So users can reorder their print jobs without the need to upload them again. They can be sure to order the exact same print job that won't differ from former orders. If print files are submitted via email or FTP to the central print room instead of using the web-to-print online shop, you as Print operator can import the PDF and Postscript files directly into the application. The print job which is created during import is displayed in the order list and can be managed there like any regular print order submitted via the online shop. So you can benefit from all the included job management features for these kind of print orders as well. All information which is necessary for printing as well as all order information are saved in the job ticket. The user fills the job ticket during ordering or, if the print files are imported in the print shop, the Print operator does so. Both select a product, specify the number of copies and choose the production- and finishing options (color or b/w, paper type, punching, stapling) and all delivery details. Afterwards the job ticket is submitted together with the print file. In our application all production details are automatically applied to the print file. As a result the imposed and print-ready file is available for printing - even automatically if desired.